Penn State men's volleyball and gymnastics continue to roll through their (respective) seasons - and the Women's softball team had a very successful trip to the Carolinas. Shopping, dinner with friends, church as well - but not really as interesting. So, our hero, Anthony Morreli, braved the scrutiny of the NFL Combine Quarterbacks' workout this weekend. Tony ran a 5.0 in the 40 - which isn't good but oh well. He did place in the top 10 (tied for 8th) in the vertical jump. His leap reached 26.5" - to put that in perspective - the top jump, so far, came from RB Carl Stewart with a jump of 39" (what?!) - and three offensive linemen jumped 26.5 as well. Not strong in upper or lower body. ... A bit of windup in his delivery. ... Very inconsistent in accuracy. ... Poor mechanics when any pressure arrives. ... Happy feet and throws off back foot, even when there is no pressure. ... Struggles to get past first read -- birddogs that read from the snap. ... Makes some questionable decisions. ... Limited mobility, both running for first downs and moving within the pocket to free himself to make the throw. Okay...sure...yes...mhmm...affirmative...I agree...he is a birddog (ya better git away quick)...yup...and, correct. The most impressive performance to date is probably Darren McFadden's 40 - 4.27 seconds - which is a little unreal. The game is April 19th, at 2pm. Parking is also free and lots (all around the stadium) open at 8am. The game, generally, pits the 1st string offense against the 2nd string defense (and #1 D against #2 O) - they even it out a bit during the day - but it's intended to showcase the talent and let some of the newbies (red shirt freshmen and early admissions) get some "game" time. The assistants coach the 2 squads and Joe sits up in the booth calling color commentary. As we've discussed, there are a ton of activities going on in Happy Valley that weekend - and we'll post more detailed information about the tailgate and other events as it becomes available. Three Penn Staters are participating in the NFL combine (today through next wednesday), Dan Connor, Justin King and Anthony Morelli. Linebackers and D Backs don't workout until next week - but they will, most likely, show footage from the weight room and other skill tests. ALL DAY – NFL.com: Video on Demand content available. 11:00 AM-2:00 PM – NFL.com LIVE: Five live streams from workouts available. The NCAA Football Rules Committee announced the newest proposed changes to the game. Most notable are, yet again, the changes regarding the clock. While the clock will stop when a player goes out-of-bounds, it will now start again when the ball is set (rather than at the snap of the ball) - EXCEPT during the last 2 minutes of each half, when the clock will only start with the snap. These recommendations are a direct result of television and requests that the college games be shortened. The Committee Chair, Michael Clark, head coach at DIII Bridgewater, was quoted to say "We wanted to find something the TV people are looking for without taking away plays from the game. The hope is we got it right." THIS IS COLLEGE FOOTBALL - it is not the NFL - it was not created solely to entertain and sell horrible mass produced malt beverages in a neat and compact time period. And yes, I do realize that I'm being so super duper naive about the priorities and contributions of mass media to college athletics. I know that the power, influence, impact, and yes, importance, of the Sports media far outweighs my opinion - but that's not going to stop me from having one. There are soooooo many ways that these new rules could go wrong and/or be abused - and this is just what we need - give the clock people more responsibility. The definition of a chop-block has been simplified to be "any high-low combination block" is illegal regardless of formations and locations. Another change for kick-offs - the receiving team will have the option to take the ball at the 40 yard line following out-of-bounds kicks. No more sideline "warnings" - crowding the sideline will result in an immediate penalty. Instant replay will be allowed on fumbles leading to immediate recovery - huh? my guess is that this will close IR loophole of fumble recoveries not being reviewable when the fumbling team recovers the ball. The 5 yard "incidental" face mask penalty would be eliminated - grabbing of the face mask which has "no impact" on the runner (or his safety) would be a non-event. And yet, a penalty for horse collar tackles will be added and the language regarding helmet to helmet infractions will be clarified and strengthened. Coaches who successfully challenge a call will retain a second challenge (for a total of 2). - Much info found at Rivals.com and be sure to follow Every Day Should Be Saturday to see how Mr. Swindle reacts the proposals. Of course, these are just proposals, that need to be approved by the Playing Rules Oversight Panel - but I'm not holding out much hope. Your team "steals" a few recruits; our team "stole" a few recruits - who cares - it's part of the game. If um fans expect PSUers to be happy because one of our verbals jumped ship at the last second - it's not going to happen. Are we going to blame your new coach and attack his integrity? of course we are. We don't like your coach - we're not going to like him. Personally, my new fondest memory of him is when he was crying at the end of the pitt game - I hope to see a lot more of that in the future. But that's okay - a few ticked off Penn State (and purdue) fans won't change much. 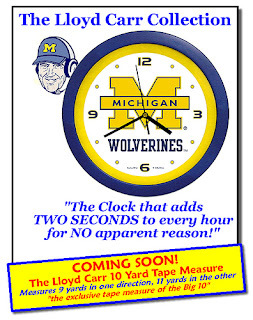 Did anyone really think that Lloyd Carr was classy? wasn't he notorious for being callous and walking off the field without shaking hands? Wasn't he the one who had the Big Ten officials in his back pocket? Was Bo Schembecler a big teddy bear? No - they were football coaches who, for better or worse, won a lot of football games the "old fashioned way". But the old ways are becoming more and more obsolete. Football coaches today need to be celebrities and "figureheads" as well as the managers their respective team(s). D'Anton Lynn and Brandon Beachum are in a dead heat for best smile ever! Yancich and Zordich make me wish I were 18 again. I watched that show - Millionaire Matchmaker - the other night on Bravo. I found it to be hilarious, repulsive and embarrassing - all at once - so, of course I watched. It was the episode when the hapless Julien alienated every young lady he met - including the Matchmaker, her VP of Matching, and his "date" Jacqueline. In the past - it might have been the schools who were the Millionaires - tons to offer - could pick and choose their favorites - and while that is still true to some extent - the kids, the student athletes, have really shifted into the role of Millionaire - sure they still have to get an official "offer" (well, most of the time they do) from their school of choice - but when you look at the number of scholarships a top prospect gets these days - it's pretty easy to determine who is doing the choosing. The prospective recruits are ranked and labeled with "stars" - and, generally, the more stars you have, the more "elite" schools that will be interested in you. Every year there is some hotshot recruit - who has been tearing up the field since his Pop Warner days - and has team representatives falling over each other trying to get a look at him. There are zillions of YouTube clips evidencing their talents. The kids are bombarded with sports media attention, all star games, and televised press conferences. It's impossible to ignore the attention, and power that is bestowed upon these teenagers - they, and to some extent their parents, coaches and "recruiting advisors" become celebrities. Every statement, action, inaction, clothing choice and/or dietary habit is reported, analyzed and then regurgitated to the pack of ravenous fanatics. Any little movement they make is interpreted and can set message boards afire with speculation. These kids, and the choices they make, can affect an enormous pool of people and their mental well being. Some kids go for the legacy - "I want a team, just like the team, that recruited Dear Old Dad". There are the "I just want to be able to say that I played at Alabama" kids, they might walk on or take a scholarship knowing that they might not see a lot of playing time. The trend today, though, seems to be playing time, which directly correlates with "getting to the next level." Kids want to know that the school they choose will do all it can to promote and prepare them for playing professional football. A big factor in recruiting is being able to promise national exposure. Illinois is a team that has taken full advantage of this - They were in the position to make a lot of promises - come play here and you'll not only get to play, but you'll be playing in the Big Ten on National Television. We'll build the team around you and I will be your biggest cheerleader. There are still kids, of course, who just want to be college football players - and 90% will never play on Sunday (not even in the Big East) - they love football and want to get an education. To me, regardless of talent and/or expectation - every kid who sends over a Letter of Intent tomorrow should be just giddy with the prospect of playing college football - on the other hand, there are a lot of college coaches who will not sleep well tonight worrying about the phone line to the fax machine and whether or not there are any last minute changes of heart. As far as we fans go - Sports fans are competitive people - we want our favorite team's roster to be filled by the best possible players - and there is also the whole ranking of recruits and recruiting classes which is just one more thing to compare and contrast. There's no doubt that when a tippy top kid commits to your school that it's a rush - it's a promise for the future, even though you have no idea of what this kid can really do or how things will work out. A labeled "Millionaire" is not always going to pan out to be a long term companion - or even a good date - just as a five star prospect won't always develop into a playmaker - as in life, it's generally the 3 star kids who are the best. And no, the Pro Bowl does not count as a football game - and neither does arena football - I don't care how dreamy Jon BonJovi is. This weekend is the last football game of the 2007-8 season - the Super Bowl. I care so very little for the 2 teams playing that I probably wouldn't even watch - if it weren't the Super Bowl. Over on Ladies... they've posted a recap of the Football Foodie series - some excellent ideas over there, I've tried a few recipes myself. Also the Ladies chronicle how to "not throw a Super Bowl Party" - it's a gridiron thing. The Martha Stewart Show today was all about how to throw a football party - I didn't get to watch it (dang work) - but I did DVR it and will be sure to review all the pointers before Sunday! From the previews, it looks like she may have two men come out and explain the rules of football - thank goodness for that! 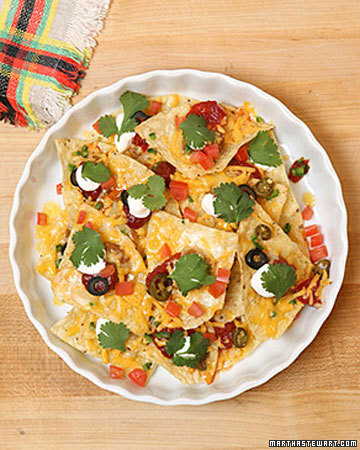 And you can get more game day recipes at Martha Stewart.com. What would we do without our Martha? there are some good recipe ideas on The Food Network as well - but I must say that I'm a little disappointed that self-proclaimed football fanatic Guy Fieri would suggest a caesar salad - seriously? salad? caesar salad. So, who do we root for? Kyle and Tommy Brady? or Kareem MacKenzie, Jay Alford and "Archie's other boy"? It's sooooooo distasteful - bleh - So, I hope that the Penn Staters do really well and look like the stars that they are - and that the ny giants stink up the joint, looking as bad as a team can, and win. If you haven't made your travel arrangements yet - you really should - the Penn State Football Spring Scrimmage is less than 80 days away! Saturday, April 19th, is, of course, the Blue White game at 2pm - complete with player photo/autograph opportunities before the game. Parking and admission to the game are free - so it's a great time to test all your new tailgating gear and recipes - and get to see some practice football as well. The baseball team also has a game Saturday afternoon (again hosting Indiana). Football Recruiting is winding down/getting interesting - as National Signing Day nears and Terrelle Pryor announces that he might delay his commitment announcement - and PSU has picked up two more promising verbals. The Men's Volleyball team is doing well - obviously inspired by the success of the Ladies team, they're currently ranked #2 in the country and win their 800th program win on Monday. They head to New Jersey this weekend for a match against NJIT on Saturday. The Men's Gymnastics team is currently ranked #1! They host top ten ranked Minnesota on Saturday. The Wrestling team suffered a bit of a slump after the National Duals - but they've held on to the #8 national ranking - tonight they go up against Northwestern, in Evanston and on Sunday they visit Illinois. Only one more month of basketball - we'll just leave it at that.